Fairly common questions at the DG when it comes to the various beautiful and unique bowls we have are… what do you do with them? Do they have any special meaning? The answers can vary depending on who you talk to, but can be as simple as: Whatever you wish, and, yes and no. Vessels can be purely decorative, or used to keep your stones or herbs in. 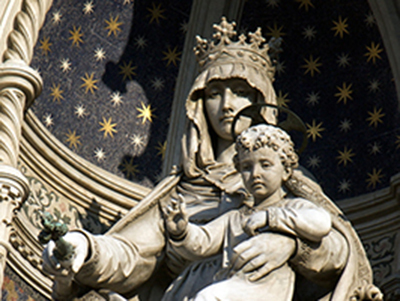 Some individuals use vessels to hold water, either to have on their altar or to charge under the Full Moon. The choice is truly yours, and it can be as sacred as you wish for it to be. This ties in to the second question: their meaning. Vessels (bowls, chalices, dishes, jars) can be rich with meaning depending on what you are using them for or what history you are looking into. In the Tarot, the suit of Cups corresponds to the element of Water, and relates to one’s emotions, as well as intuition, the subconscious, and dream time. 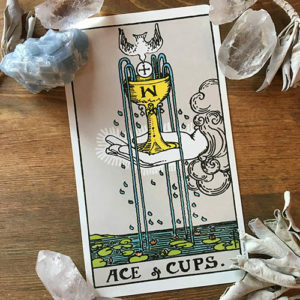 The Ace of Cups, pictured here, may refer to your direct connection with the overflowing of love, compassion, emotion, or creativity and inspiration from Divine source in your life. 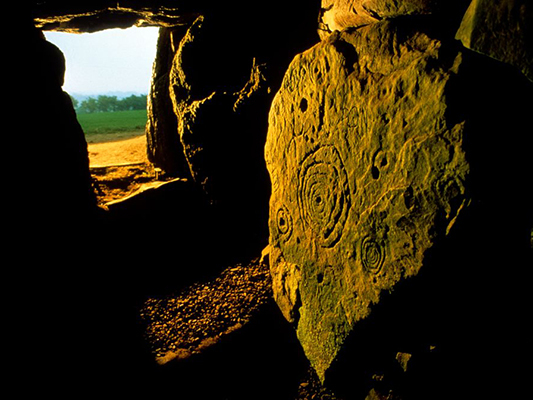 Throughout countless texts, artistic depictions, and various Indigenous and ancient beliefs, bowls are symbolic of the Divine Feminine, the womb, or the Womb of the World; powerful symbols of fertility and creative energies. Depending on what the vessel is crafted from, or the symbols and sigils adorning it, these properties can enhance any meaning it may have as well. This particular bowl is made of Blue Calcite (occasionally referred to as Blue Onyx, or Lemurian Aquatine Calcite). Energetically, Blue Calcite is exceptionally soothing to the emotional body. While it connects with one’s psychic field and abilities, it also helps to calm psychic stimuli for those who are particularly sensitive, and allows them to relax. Blue Calcite is linked to both the Throat (4th) and Third Eye (6th) Chakras, making it a perfect stone for accessing higher intuition, inspiration, and then using your gifts to express those ideas. It can help with Dream Work as well, enhancing your dreams in their symbolism and vividness, while also aiding you to more easily recall those dreams and integrate them in to waking life work. 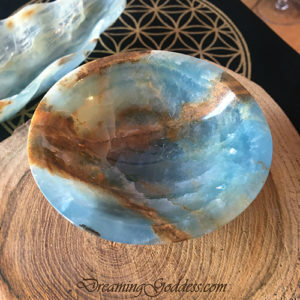 Keeping in mind these metaphysical qualities of Blue Calcite, and combining them with the symbolism of vessels, this could be a perfect tool to keep on your bedside to help connect with the subconscious and creative visions from your dreams, in your meditative space for journey work, or in your creative space to amp up your artistic inspiration. 1. Use for Lucid Dreaming & Journeying – Place Mugwort, fresh or dried, in the bowl and keep next to or under your bed. Mugwort is connected to the moon, and used in divination, visionary dreams, and opening the Third Eye. You can also add a Quartz crystal to further amplify these energies. ~ You could also place the Herbal Dream Blend in the bowl. Keeping it near your bedside would facilitate gentle, prophetic, lucid dreaming. 2. Select a group of stones to place inside the bowl to work in conjunction with one of the aspects of Blue Calcite. 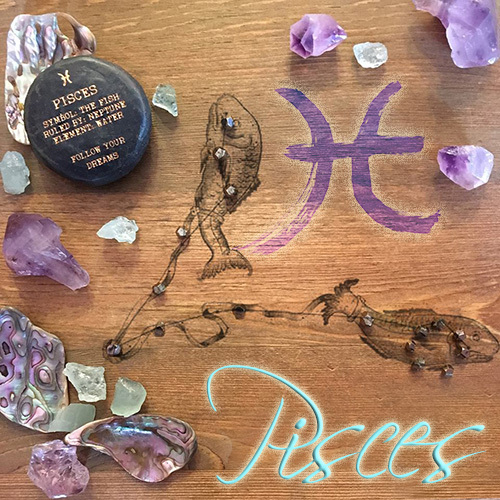 The Psychic Abilities set, which contains a powerhouse of stones, all chosen for the various ways they can enhance and work in tune with your psychic abilities, would work beautifully with this vessel. The Blue Calcite would help one to keep from feeling overwhelmed by excess stimuli, while tapping into the messages and visions during your meditation. ~ Two other stone sets that would align nicely with the energies of this bowl would be the Sweet Dreams Stone Set and the Fertility Stone Set. 3. 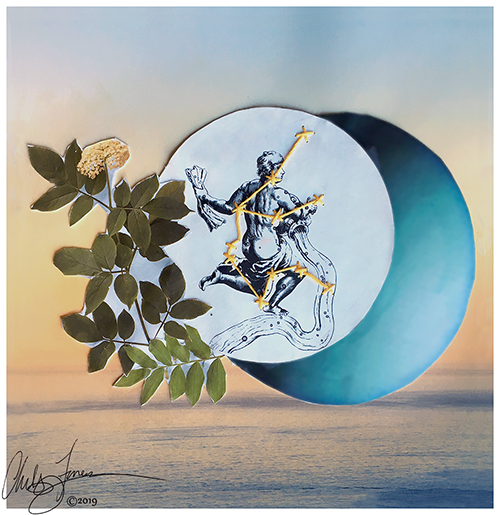 Use the bowl to either collect rainwater, or to charge water under the Full Moon and use it to anoint yourself, tools, or an offering in your space. 4. Place specific jewelry or tools in the bowl that you wish to set an intention with, in line with the properties of Blue Calcite; Perhaps a favorite pen, and let it sit overnight, setting creative and inspiring intentions for its use. 5. Add the burning of a candle in a corresponding color, to any of these practices and you would have the makings of a beautiful small altar and ritual – just be sure to blow your candle out before drifting off to sleep! No matter the countless ways you may use this or any other vessel, a bowl or a chalice is such a common tool used in everyday life, and are among artifacts found buried in some of the Earth’s most ancient civilizations. 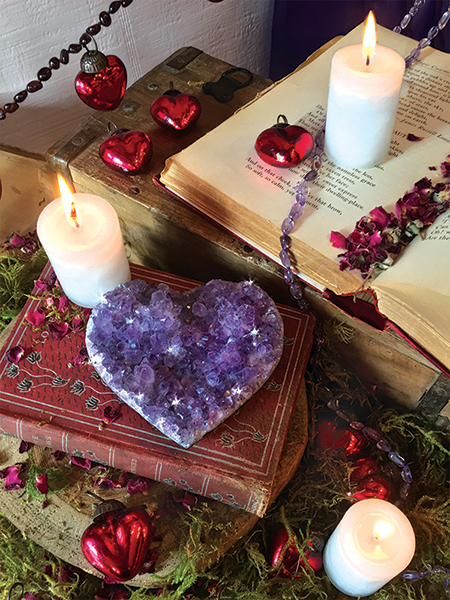 Whether you decide to use these objects for a specific, sacred use, or to use them as decoration simply because they bring joy to your heart, it is just another way to make the ordinary extraordinary, and add a little more magic to your world. However you use them, the choice is truly yours, and whatever you decide is the right answer. We currently have a cornucopia of bowls and dishes to infuse a little more magic into your daily life. From natural Abalone shells, to carved stone, to meticulously handcrafted works of art, you are destined to find something to enchant you.